Pests can be quite irritating- even the thought of an invasion is enough to drive some people over the board with preventive measures to try and keep them out. Which is probably the best way to deal with pests in Toronto except for the fact that pests are quite resilient and will, eventually, find a way to get into your home? When that happens, there is a correct way to deal with them and then there is a wrong way to do about it. The first thing you need to do when you suspect that you may have a pest invasion in your home is to try and identify the culprit. Pests have a habit of leaving marks wherever they go so if, for instance, you discover that pests are chewing through furniture in your house then you will probably find rat droppings somewhere in the house which will tell you that they are the cause of the problem. Once you know the culprit, the next step is to determine the extent of the problem before you come up with a plan to deal with it. 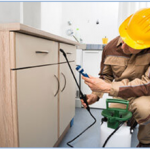 If it seems like a serious problem then your next move should be to get in touch with a professional company like Pestico that offers pest control Toronto services and have them deal with the problem on your behalf. The biggest advantage of doing so rather than trying to solve the problem on your own is because they have the knowhow and equipment to deal with the problem quickly and efficiently. The two biggest mistakes that you can make when you attempt residential pest control on your own is using too much of chemical products to kills the pests or using the wrong products. If you do this then at best you may end up failing to solve the problem or, at worst, putting your entire family at risk.